THE SKINNY: I've never really had a lot of luck with nail decals. They always come off after a day or feel too thick and I just pick at them. Or I just make a mess trying to get them to stick in the first place. Nailed Kit's Halloween Decals are by far the easiest I have used to apply and days later they are still in place. (And I have not picked them off at all.) Plus, the little Jack'o Lantern's are quite cute for this time of year. The decals come on a small sheet. You have to cut them out to apply. (Make sure to cut them as close as possible.) Then press on to nails and hold with a damp cloth. Cover with a topcoat. And you are done! The only downside is that there are six of each decal design in the package. So if you want to do all 10 fingers (or toes) with the same design, you will need two packs. These decals come in a ton of designs and Nailed Kit even has a monthly club. 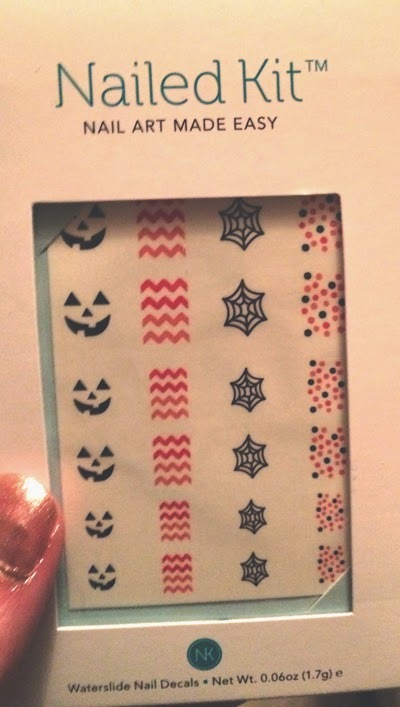 CHECK IT OUT: The Nailed Kit decals came in a recent PopSugar Must Have box. (I love this monthly box of goodies. This months box also included a pair of Happy Socks, buton London eye pencil (look for that review soon), Isaac Jacobs ohoto frame, Mine Design chalkboard candle, Dean & DeLuca pumpkin spice malt balls and K. Hall Designs olive oil bar soap. You can learn more about Nailed Kit online.